D’Bah Boardriders yesterday won the Volcom Kirra Teams Challenge with the event finals being staged at their home break of Duranbah Beach. 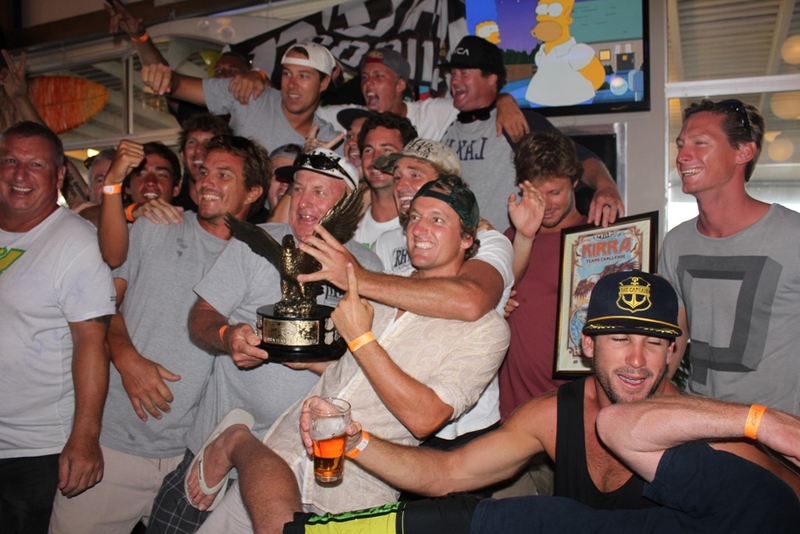 It is the second consecutive year D’Bah have won the title and sets them up as currently the best board riding club in Australia. After two days of battling atrocious conditions at Snapper Rocks and Duranbah Beach, conditions cleaned up moderately for an exciting final day of competition in punchy 2-4ft surf at Duranbah. In an exciting countdown, D-Bah (29) finished ahead of Snapper Rocks Surfriders (29), Le-Ba Boardriders (28) and Kirra Surfriders who finished 4th with 26 points. 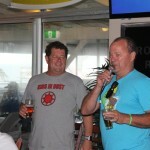 D-Bah edged out Snapper on countback after securing six wins from its eight surfers to Snapper’s five. Points are awarded in each heat on a 4-3-2-1 basis with 4 for a win and 1 for a fourth. 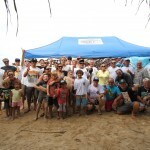 The D-Bah team consisted of Asher Wales, Jack Scollard, Samba Mann, Nick Vasicek, Brent Dorrington, John Cummings, Damon Harvey and Jack Freestone. With the lead swapping throughout the day, Le-Ba’s Stu Kennedy put his club in front with a commanding win with seven rounds remaining. The pressure was then on D-Bah’s final surfer, ASP World Junior Champion Jack Freestone to win his heat to ensure D-Bah retained the title. Had he finished second, Snapper’s final surfer Mitch Crews could have snatched the title for his club in the following heat. 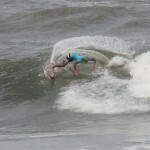 Former ASP World Tour competitor Nathan Hedge, surfing for North Narrabeen, tried his best to stop Freestone, but the D-Bah surfer kept his nose in front after taking the lead early in the heat. Hedge couldn’t find the 7.74 needed for victory and Freestone emerged triumphant from the surf and was chaired up the beach by his jubilant clubmates. 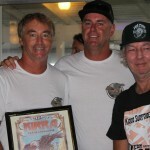 Crew was victorious in the next heat to ensure Snapper secured second place. Leading into the event the Kirra team of Asher Pacey, Corey Zeims, Mitch Duggan, Sam Clift, Sam Watson, Andre Teixeira, Jake Cumberland & Max Tobin also had high hopes for their title chances. With a strong start by the Juniors, Jake & Max with two wins, followed by a 2nd placing by Andre, Kirra was equal leader with Snapper & D’bah after day one. The variable conditions on Day 2 hampered Kirra’s chances with 2 x 3rds followed by a 1st place (Cliffy), seeing them drop back to 5th overall. 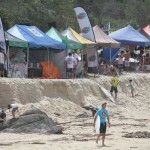 Day 3 saw Mitch secure a 2nd place, setting it up for Asher to require a win to cement 4th place outright for Kirra. With a total heat score of 15.17 (including an 8.83 on one wave) Asher blitzed his heat to take out the win. The 4th place was a vast improvement on Kirra’s 2012 result in the same comp where they placed 16th overall and the team is now confident of doing well also at the upcoming Jim Beam National finals to be held at D’bah in April. This year Kirra also fielded a Junior team made up of the most promising 17 y.o & under surfers in the club with the view to them gaining the experience required to one day step up into the main team. The team consisted of Josh Atkins, Lewis Capellari, Dextar Muskens, Paul Pasados, Chris Slade and Dylan Totten with Blaine Robinson & Korbin Hutchings chosen to compete against the other juniors in the comp. The surprise result of the Junior team was Chris Slade who placed 1st in his open heat with a 12.84 total heat score, beating more fancied rivals including world tour professional Chris Salisbury of the North Avalon Surfriders club and relegating the Coolum and MNM team riders to 3rd & 4th. No doubt we will see Chris included in the Senior team one day soon. Blaine and Korbin also did well each placing 2nd in their respective Junior heats. Finally a huge thanks to all the Kirra members and volunteers who worked tirelessly over the three day event to make it a huge success. 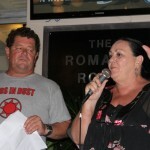 Well done and congratulations on helping to make this event a success and our club so strong. The Volcom Kirra Teams Challenge is proudly supported by Volcom, Gold Coast City Council, XXXX, Surfing Australia, the Hurley Surfing Australia High Performance Centre, Surfing Queensland, TV4Me, the Australian Government’s Illicit Drugs In Sport (IDIS) program, All State Partners, Rainbow Bay Surf Life Saving Club and Banana Wax.